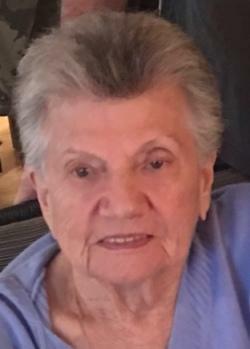 Ellajean (Ameen) Elias, 96, of Boca Raton, Florida, formerly of Lowell, died peacefully on Sunday, December 30th at her home with her loving family by her side. She was the beloved wife of the late Lionel S. Elias (Lenny) who died December 30, 1986. Born in Lawrence, Massachusetts, January 21, 1922, a daughter of the late Louis and the late Mary (Mansour) Ameen, she attended Lawrence schools and was a graduate of Lawrence High School with the Class of 1940. Before retiring, Ellajean was employed as a Seamstress at Hanscom Field in Bedford for many years as well as being a full-time homemaker. She was a member of St. George Antiochian Church in Lowell. Among her many interests, she enjoyed cooking, sewing, painting, designing furniture and interior decorating. She was also a member of the Ladies of St. George as well as the St. George Couples Club. Ellajean is survived by a daughter Donna M. McGarry of Kittery, ME; two sons Donald Elias and his wife Phyllis of Boca Raton, FL and David Elias of Dunstable, MA; three grandchildren Desiree (Elias) Toto and her husband John, Alicia (Elias) MacDonald and her husband William and Donald Phillip Salem Elias and his fiancée Lauren Melberg; a sister Lorraine Recupero of Dracut, MA; four sisters-in-law Rosalind Elias of New York, NY, Patricia Elias of Charleston, West Virginia, Barbara Ameen of Methuen, MA and Deannie Ameen of Andover, MA; her best friend Lorrice (Forsley) Ansara of Lowell, MA; and many nieces, nephews, cousins and close friends. She was also mother-in-law of the late Edward McGarry. Friends may call at the O’DONNELL FUNERAL HOME, 276 Pawtucket St. at Fletcher from 2 to 6 P.M. on Sunday. Relatives and friends are invited to attend her Funeral Service to be celebrated on Monday morning at ST. GEORGE ANTIOCHIAN CHURCH in Lowell at 10 o’clock followed by burial in Westlawn Cemetery. E-condolences/directions at www.odonnellfuneralhome.com. Those wishing may make contributions in her memory to St. George Antiochian Church, 44 Bowers St, Lowell, MA 01854. Arrangements by James F. O’Donnell, Jr. (978) 458-8768. Sincere condolence to the Elias family. While words fail to capture the pain of losing your belove Ellajean, you can look forward to the time when words will fail to express the joy of having our Heavenly Father return your dear one soon—Psalm 146:4, Ecclesiastes 9:5, John 5:28-29. In the meantime, may our Heavenly Father, and cherished memories strengthen you to cope at this time. Our prayers and thoughts are with you Donald and Phyllis. Your mother was such a lovely woman. She always made me smile with her witty humor. My thoughts are with Donna, David, Donald and Phyllis. Her love for you will always be there in your hearts.